Between the two of us, Porter was always the fiscally responsible one. Every Christmas, my pants would virtually incinerate from all that money burnin' in my pockets (I've obviously done a good job curbing these shopping urges as I've aged). Porter, meanwhile, would put the money aside with her eyes on bigger prizes. So, when I turned 16, I owned roughly 3,456 CDs. When Porter hit that age, she paid for half (our parents picked up the rest) of a vintage Mercedes convertible (1982 450 SL) with original hard and soft tops (which she kept up the moment it cracked the 40-degree mark). The thing is, these spectacular European autos aren't that pricey, especially in comparison to the brand new SUVs our schoolmates drove. 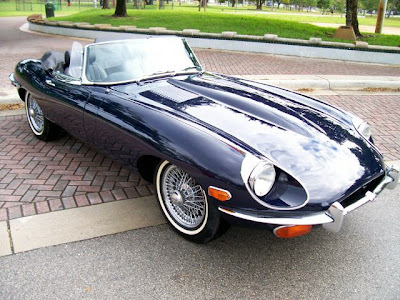 That generality doesn't necessarily apply to this restored 1967 Jag E-Type XKE Roadster. The Ebay reserve isn't met at $65,211. But c'mon. Bid away. It's worth it just for that steering wheel. Even if you can't afford to fill up the tank! (I'm attending the auto show festivities tonight, so cars were on the brain. I'm sure I'll leave crestfallen from the lack of chrome). as with everything...keeping it sophisticated. Oh Ms. Hovey, a Jag is my dream. You've found a beauty here. 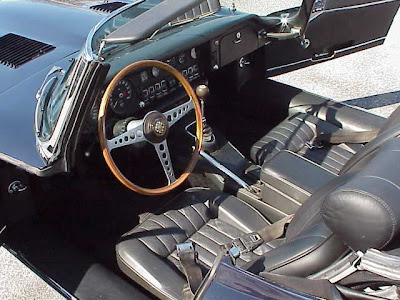 Of course, I'd prefer a 1950's XK140, but this'd do nicely.